For 144 years, FNB has taken pride in being locally owned, locally operated and committed to the communities we serve. 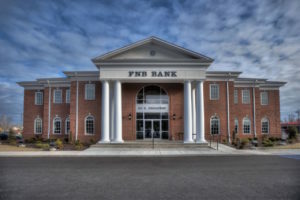 FNB has developed a rich tradition in banking wherein it remains as the 8th oldest bank in the state of Kentucky. As of today, FNB operates eight offices located in four counties in Western Kentucky. Currently, the Board of Directors consists of Marty Nichols, Charles Shields, Kenny Hunt, Tony Goodman, Ben Cundiff, Pete Mahurin, Jim Woods, Howard Cochran, Michael Vitale and Jim Brien. FNB continues to deliver a wide range of products and services – including state-of-the-art offerings like online banking and bill pay, mobile banking, and electronic statements. You will also find the service you receive from our lending officers second to none. In addition, FNB is ranked among the highest in the nation in the area of safety and soundness. Above all, your goals are our goals, and we look forward to being your financial partner by providing you with a noticeably better customer experience. Let’s Start Something Today!